Tortoises are primitive animal, they are created to wander in the wild since the age of dinosaures. Six o’clock in the morning, everybody is in a hurry, people are driving to work, kids are dropped to school, but yet Rasoa doesn’t start to move. Rasoa is 30 years old and since my brother adopted her 20 years ago, she has never left her yard. She will wake up only at 9, Rasoa has nowhere else to go and nothing to do, and my brother expects nothing from her. This is because Rasoa (Rasokatra) is not a human, but a Radiated tortoise, a pet inherited from our grandmother. A simple definition of pet : “animals intended for human companionship”. For tortoise, it’s not the case. Malagasy people associates the tortoises with medicinal virtues (kept in the garden for healing children asthma or preventing poultry from disease) or decorative purpose rather that be a companion. So it’s not rare to find tortosie in garden like Rasoa. But wild animal kept in captivity is living a miserable existence. It’s like you or me living like a prisoner for the rest of our lives, deprived of all its rights (the right to be free, the right to ensure its species survival). Moreover, people don’t care about their comfort. Like all reptiles, tortoises are coldblooded and they need their South native sun and heat, not the cold weather in Tana in August. Do you every know of someone worrying their tortoises are cold? Tortoise can’t be a pet as it would never behave like a normal domestic pet. I might be wrong, but we want from our dog or cat pets their love, and we want this to be expressed in a way that we can understand : the dog jumping happily towards us when we are back home, or the cat purring with pleasure when we caress him. Rasoa and her relatives, however are unable to show such sign of affection, and they are unhuggable. If they escape your yard, they are not loyal enough, they won’t go back home. Simply because they are primitive animal, they are created to wander in the wild since the age of dinosaures. People kept tortoise despite being aware that owning a tortoise is illegal under Madagascar and international law. This may suggest that enforcement is limited. Recently I came to visit a friend who just move to a new house. In his garden, 2 tortoises, they belongs to his home owner, a government official, who should be enforcing the law. When I talked to his owner with his wife, that it’s illegal practice. They said, “it’s not a real crime”? They got the two tortoises, an impulse purchase, during their holidays in the south, to please their daughter who wanted to have them as pet. Anyway they said : “we were saving them from a premature death as people would have eaten them”. What? Succumbing to such purchase encourages wildlife illegal trafficking. People often ignore that getting oneself involved in illegal wildlife trade is a crime and is liable to imprisonment. 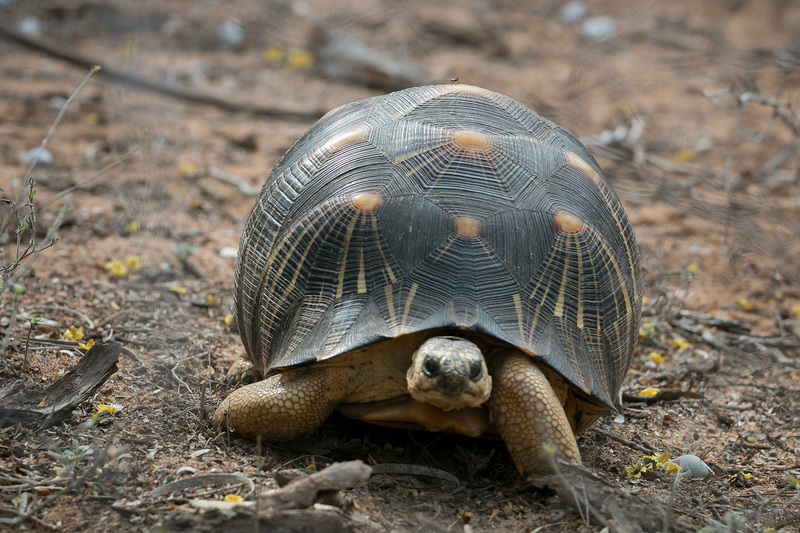 The above cited tortoise species are among the 25 most endangered turtles and tortoises. A 2013 estimate of Radiated tortoise put their numbers at six million, down from 12 million in the 1990s. Today the population is likely closer to three millions (Turtle Survival Alliance, 2018). Do you know about “the Tortoise and the Hare” fable? The wise tortoise won the race. But in a race against its own exctinction , tortoise won’t win, unless human helps them with the same wisdom. So help us ban tortoise illegal trade and tortoise collection. Whenever you are tempted to buy or bring home a tortoise, call the sane part of your brain to reminds you that wild animals aren’t pet. Should you have illegally a tortoise in your possession, relinquish it to a responsible tortoise rescue. And should you come across a tortoise crossing a road, leave it alone or move it out of the road.